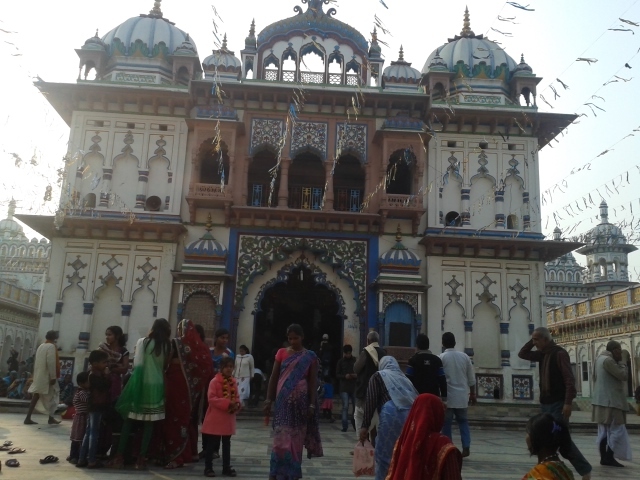 Its called Janaki Mandir, the very large – surprisingly large – and important temple in Janakpur. I had seen pictures before I came and had expected a palace-like building on a hill somewhere, overlooking the town. But its not elevated. Its downtown, amid all the chaos. Just sitting there, overshadowing everything else. 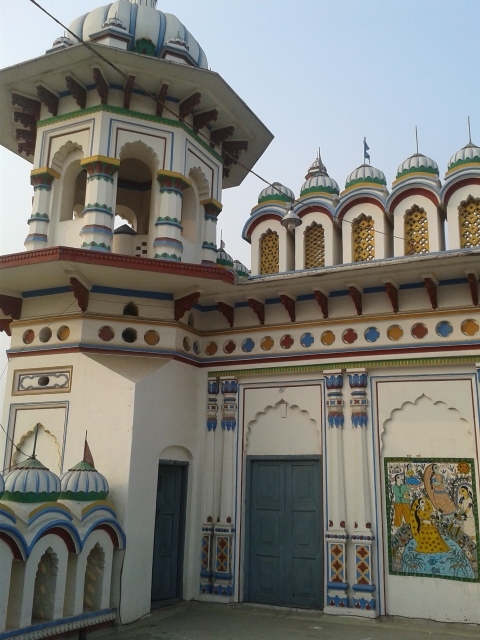 Janakpur’s temple is dedicated to the gods Rama and Sita and, as they are major figures in Hinduism, Janakpur is an important pilgrimage site for Hindus. There was a protest going on the day we arrive, with crowds and police hanging out in front of the temple. As I started to unravel some of the legends surrounding the gods, I began to notice references to them in paintings and sculptures. Upstairs in the cultural museum, for 15 rupees you can watch mechanical animations of the stories from Rama and Sita legends, protected behind glass. Although a little cheesy for my taste, it was cute to see the effort put into them as colourful, dancing mechanized dolls slid up and down rails, chanting or dancing, relating scenes from the religious stories. For me, the animated displays weren’t the reason to pay the entrance fee. I loved the view you got down from there into the temple courtyard. In a way it was the “usual” temple scene, with praying, eating, kids and cows all going on simultaneously. 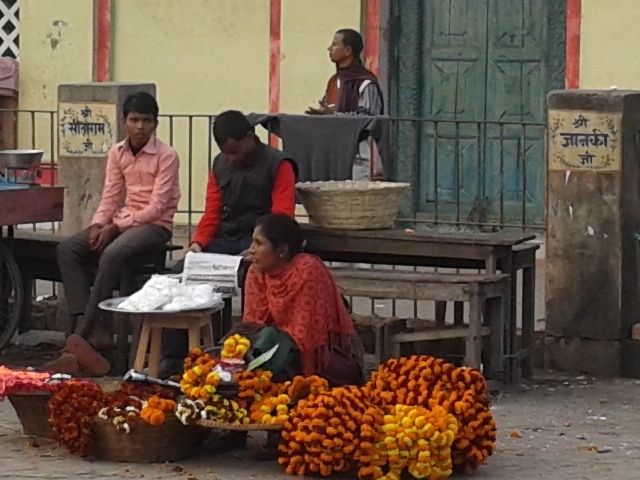 But it was also different as the architecture was completely unexpected and unlike anything else I have seen in Nepal so far. Inside the temple’s exterior walls, the main temple sits in the middle of the courtyard. This was a “shoe off” zone and probably not for non-hindus, so we never went inside. The temple is around 150 years old and kept in very good condition, especially considering the many maintenance challenges here. But I couldn’t help wondering why so place so beautiful and so holy wasn’t kept cleaner. I did see someone trying to clean up, but she was old and slow, and only one person. The litter, dirty water and cow messes were everywhere. That was a real shame. 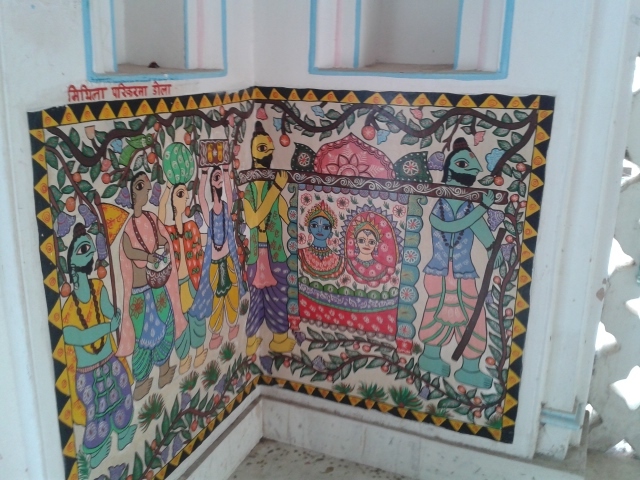 There were many decorative pieces around the temple painted in the style of the local Maithil artists. Clearly this is another representation of the marriage of Rama and Sita. My first encounter of Janaki temple chanting was the evening of our second day in Janakpur when it started, broadcast noisily over loud speakers. 36 hours later it was still going strong, having continued all through the night and, quite honestly, it was starting to drive me a bit nuts. When I asked around I was told there the temple had a chanting tradition, which goes on 24/7 year round. This didn’t quite make sense as the town was quiet the first day, and sometime later the chanting inexplicably stopped. Did it go on 24/7 or not? I never did quite get to the bottom of it. The best we could figure out is perhaps someone paid for the chanting to be broadcast (during a wedding perhaps?) and the reminder of the time a holy man chants quietly in the temple somewhere, hopefully geting someone to change shifts with him occasionally….. Ram Sita, Ram Sita….